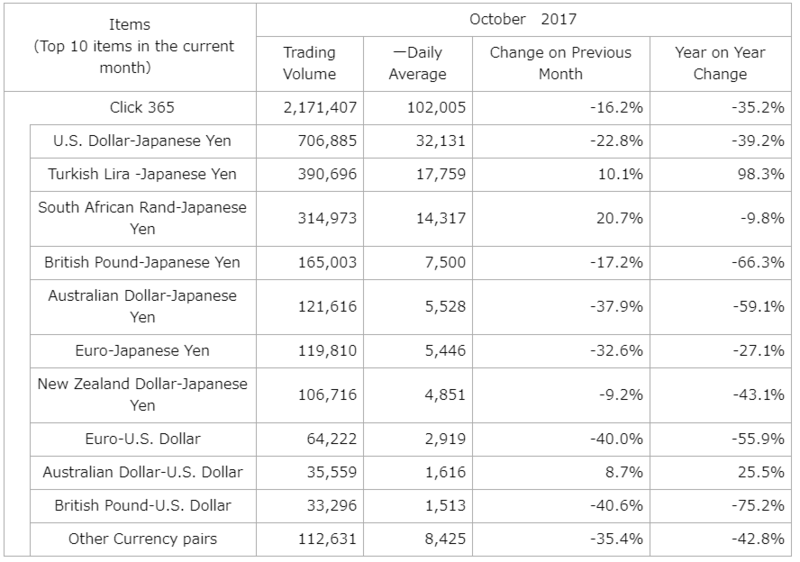 October 2017 FX Industry Metrics: Tiny Road Bumps? Trading volumes smashed records in September, so it’s understandable that market players took it easy in October. Monetary policy biases and U.S. tax reform were still in the spotlight, but uncertainties seemed to keep traders a bit more cautious than usual. Derivatives marketplace operator CME Group saw 888,000 FX contracts per day in October 2017, down from the previous month’s 1.3 million average daily volume (ADV). On a year-over-year basis, however, this represents a 15% gain from October 2016. Multibank forex aggregation service FXSpotStream reported a 17% monthly decline in trading volumes to $19.9 billion last month, compared to a record ADV of $23.9 billion in September. Nonetheless, October 2017 was still its third best month for this year. Forex ECN FastMatch reported a 14% slide in institutional FX trading volumes from $20.9 billion in September to $18.0 billion per day in October. Another ECN, Hotspot FX, saw a smaller 3% dip to $32.0 billion daily from the previous month’s $33.1 billion figure. NEX Group PLC saw spot forex volumes fall 17% month-over-month to $80.6 billion, but this still marked a 5% gain from October last year. GTX saw a 10% monthly decline in institutional forex activity, likely due to weaker volatility during the period. Over in Japan, the Tokyo Financial Exchange reported declines on a monthly and year-over-year basis of 16.2% and 35.2%, respectively. The breakdown of currency pairs traded dollar pairs such as GBP/USD and EUR/USD chalked up significant declines in volume for the period, likely due to sideways price action for the most part. EUR/JPY and AUD/JPY also saw dips while emerging market currencies such as the Turkish Lira and South African Rand enjoyed gains. Reviewing euro price action for October shows a lot of consolidation across the board as traders probably eased up on their bets leading up to the highly-anticipated ECB decision. Aside from that, geopolitical risks stemming from Catalonia’s independence vote also kept the shared currency on edge. Meanwhile, sterling also appeared uneasy ahead of the BOE decision as policymakers had to contend with rapidly rising inflation against the backdrop of Brexit risks. Looking ahead, this month seems set to be dominated by U.S. tax reform updates, and the tossing and turning could continue to limit dollar volumes. A slight shift in the RBNZ’s tone could impact Kiwi activity down the line while Brexit-related updates could push the pound around.